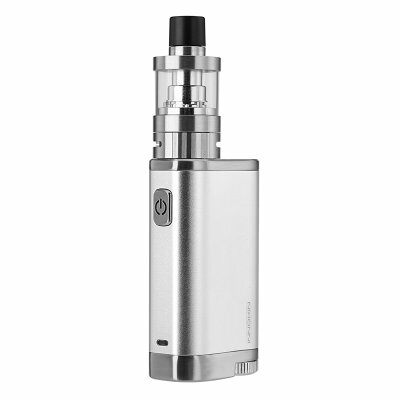 Successfully Added Innokin SmartBox E-Cigarette Vaporizer - 510 Thread, 18650 Battery, 45 Watt, Adjustable Airflow (Silver) to your Shopping Cart. With the Innokin SmartBox 45W box mod kit, countless hours of high-end relaxing and tasteful vaping sessions lay ahead. Coming with all the pieces needed to assemble your own vaporizer, this mod kit features all that’s needed to enter the world of vaping. Perfect for all smokers out there that wish to leave behind harmful tobacco products, or for those of you that simply like to give vaping a try – the Innokin SmartBox electronic cigarette is a great mod for starters and experienced vapers alike. Crafted out of a high-end Zinc alloy, this E-cigarette features a stylish design that not only is appealing to the eye but also extremely durable. Its small size and light weight make the Innokin SmartBox extremely portable, allowing you to simply slide it into your pocket and carry it along wherever you go. Packing a compact yet powerful 18650 battery (not included), you can be assured that this electronic cigarette packs enough juice for you to get through multiple vaping sessions without ever needing to worry about battery life. With the Innokin SmartBox at your side, you’ll be able to enjoy a relaxing and tasteful vape at any time of the day. Featuring a maximum power output of 45W, this vape mod kit packs plenty of power through which it’s capable of providing a pleasing vape experience to both beginners and experienced vapers alike. With its adjustable airflow design, the Innokin SmartBox vaporizer additionally allows you to control your vapor output and taste, letting you customize your upcoming vaping sessions to your exact personal liking. Packing two high-quality coils that feature a 0.5 and 1.2-Ohm resistance, you can be assured that this electronic cigarette produces exceptionally large vapor clouds while providing you with a strong and delicious taste. No matter your vaping style, this electronic cigarette is sure to meet the liking of all vapers out there. With its 510 thread, the Innokin SmartBox 45W box mod kit can be used with the majority of tanks and atomizers out there, providing you with countless of possibilities to customize and upgrade your vaporizer. Coming along with a hand full of safety features, this electronic cigarette features short circuit and reverse polarity protection, assuring that you’ll be able to enjoy all the benefits this electronic cigarette has to offer in a secure manner. By supporting the latest intelligent Wattage control technology, this box mod kit is guaranteed to bring along the perfect vape experience. Simply fill up your tank and attach your CTL or MTL coil to the SmartBox, and this magnificent vape mod will automatically detect the resistance and adjusts its Wattage accordingly – guaranteeing that your settings will be automatically set right to provide you with the ultimate vape. The Innokin SmartBox 45W vape mod comes with a 12 months warranty, brought to you by the leader in electronic devices as well as wholesale electronic gadgets..